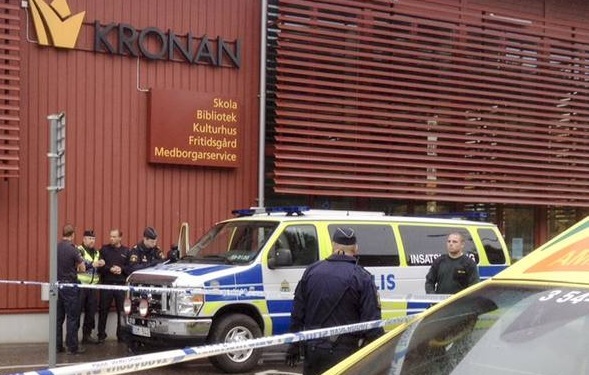 A 21-year-old man entered the Kronan School in Trollhattan, Sweden, armed with a sword and killed a 20-year-old teacher and a 17-year-old student. He also wounded two other students before being shot and killed by police. The assailant was wearing a black trench coat, some kind of face mask and what appears to be a WWII era German military helmet or a replica thereof. When he first entered the school some students though it was some kind of prank and posed for pictures with him. His name has not yet been released by authorities in the area. However local journalists found the assailant’s social media accounts which may contain glorification of the nazis and xenophobic rants against Islam and immigration. Police said that the suspect had these beliefs but could not comment on whether or not this was the motive for the attack. In the past 15 years I’ve been writing about school violence I could probably count on one hand the number of school attacks in Europe. The ones that jump immediately to mind are the 2008 Kauhajoki School shooting in Finland, the 2006 Geschwister Scholl school shooting in Germany, the 2009 Albertville-Realschule school shooting also in Germany, and the 2014 shooting at School No. 263 in Russia. While Europe isn’t immune to such attacks they are nowhere near the scale of how frequently they occur in the US. It feels like the toxic sense of entitlement that most if not all American school shooters have is bleeding over into Europe. No one can deny that school shootings and other attacks of violence at schools are uniquely American and unfortunate our particular brand of cancer is spreading. Thanks to Jade for the tip. UPDATE: Of course after I hit publish I found out that the suspect’s name has been released and his name is Anton Lundin Pettersson. Too tired to post any more details tonight. More tomorrow.